The first link (I love museums) takes us to your article in "Democracy," which contains a link (Detroit's "about" illustration) that apparently does not take us to the photo that your article says it will. Nor does the link (Art Institute of Chicago’s picture). Well taken, for sure. Hoping you also sent this to the Museum so they can improve. I would certainly have appreciated that information. art museums’ worst instincts to make not only the typical visitor, but almost any visitor, feel unqualified and inadequate. When I was much younger than I am now, I had a weekend job at my local NPR affiliate as the announcer for a Saturday morning classical music show. I cannot remember what prompted it, but I will never forget getting dressed down by the station manager for saying something that (as he put it) would make the listeners think they were unqualified to listen to my show. I know just what you mean. In the mid-1970s, I spent a long full day at the Smithsonian. It might be much different now, but back then — when I was still in college, mind you — I noticed, and was deeply annoyed, by the paper-thin interpretive materials on the displays. I recall they had a recreation of the 1876 Centennial Exhibition in one hall — 100 years on — and there were these mechanical marvels from 1876 looking like they'd just come from the factory. But if you couldn't tell what they did, you wouldn't know what they did. Or much who built them, or anything else. This was true all the way through, building after building along the Mall, including the space and aeronautic displays, natural history, and more. Everything had SOMETHING posted with it, but not nearly enough. And an interesting counter-point: some years later, in the 1990s, I was fortunate enough to visit the Corning Glass Museum in Corning, NY. I LOVED it! A much smaller museum, to be sure, but I spent many hours there because every display was marvelously notated. Not just a lot of facts and figures and context, but well-written stuff. The only exception were the study cabinets, rows and rows of glass objects with minimal descriptions; these were things intended for scholars, but unlike most museums the Corning was considerate enough to have them out on display rather than invisibly packed away. To this day it's easily one of my favorite museums. I suspect that this sort of esotericism, if that's the right word, is more common with contemporary art. Would the museum be as unhelpful with ancient art, which everyone knows needs contextualizing? Often art exhibits result in printed catalogues, and museums usually put a few of them in a separate room, where visitors may read them. The Met in NYC is very helpful in this way. I often find myself scurrying back and forth between art works and the catalogues, which contain more information than is ever presented in wall captions. The Met now puts its exhibits online,as it were: each item is shown, along with the caption text, as well as other information. In some cases you can examine a work online more carefully than you can the physical object, because of the ability to zoom in or view it from certain angles. You're right–the obscure pun is insufficient. 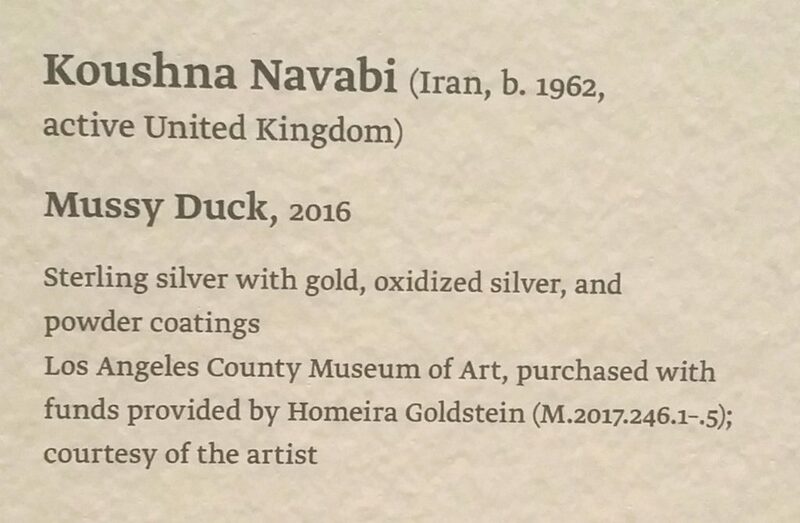 I know exactly who Mossadegh was, and "Mossy Duck" flew right over my head. Me, too. My Con Law teacher was a refugee who'd served in Mossadegh's government, I think in finance. It's been decades. Ha. Come sit by me! I am miffed at Lacma bc of this plan for a fancy – and not-to-my-taste – building, the “Blob,” which more to the point, I am not sure is necessary. (“They” said the current bldgs need some $300 million in reno. I have no way of knowing if that’s true. I don’t believe an audit was done. Though it’s possible they did one & I didn’t hear about it.) Our normally staid supes threw in $125 million of our money so I’m not happy w them either. Otoh, they seem to’ve started letting poor people come into the special exhibitions, which is nooooooble of them. I agree w you about information, for this kind of cross-cultural sharing. Maybe the new bldg is taking up too much time & energy. I've made this point before, but it bears repeating grouch grouch.. Barcodes (preferably the rich square form) allow easy access via smartphones to web pages with as much information as the visitor can stand. I've come across this in a mangrove park in Thailand, on labels nailed to trees. The cheap method is just to link to a generic website on say trees. If you have the resources of a major museum, they can set up a link to the entry in the catalogue raisonnée or whatever they call it. And create a special simplified site for young people. I agree, technology has a lot to offer here. Some museum apps are starting to do this, also audio guides (though the copy for those is very varied in quality.